A beauty clinic at 5 Waterloo Street, Clifton now has a blue plaque to commemorate the Troubadour folk club which was based there from 1966 to 1971. In the sixties, Georgian Clifton was dilapidated and bohemian, providing cheap accommodation for students, artists, musicians and writers. Inspired by New York’s colourful and alternative neighbourhood, Greenwich Village, the folk club gave its address as ‘Clifton Village’ on posters in 1970, the first time this address was used. Clifton Village is now firmly established in our vocabulary, and especially the patois of estate agents, restaurants and coffee shops. The club had a serious reputation as the leading contemporary folk venue outside London. Its tiny stage attracted performers of national standing: The Incredible String Band, Al Stewart, Bert Jansch, Tim Hart and Maddy Prior, and the Strawbs. 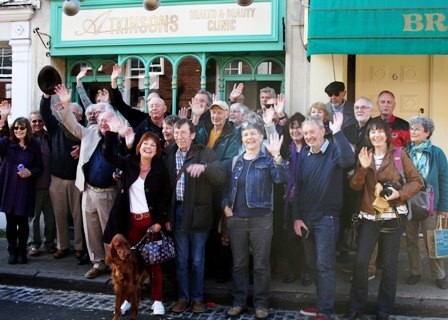 Around eighty folk fans and past performers attended the unveiling.